There are a number of newly-minted diagnoses that have been invented to explain many of the symptoms of the modern epidemic that covers autism. These conditions frequently display such similar general patterns that, depending on a practitioner’s inclination to be a ‘splitter’ or a ‘lumper’, the available treatment regimens could vary widely. 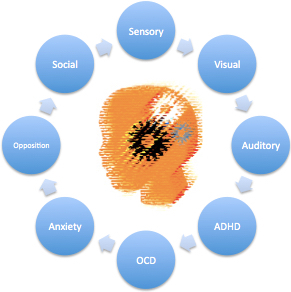 For example, AD and HD are usually treated as ADHD, with stimulant medications, even though inattention, poor focus, distractibility and hyperactivity may arise from a variety of physiological conditions. Likewise, aggression, obsessive – compulsive behaviors, and opposition are usually prescribed anti-anxiety medications, such as Risperdone, Abilify, Intuniv, or even Prozac and Zoloft. Some are more or less related, and others may be merely due to immaturity, therefore patience and time will yield preferable results. It is not difficult to imagine that processing difficulties in vision, hearing, touch, and the other senses, can lead to signs, such as repetitive behaviors or ‘stimming’, to alleviate the sensory overload. Supplements, such as magnesium, turmeric, epsom salt baths, essential oils and even HBOT could address those issues, in addition to traditional therapies. Most parents of children with ASD own at least one trampoline. Restricted interests and repetitive behaviors are core problems in patients with autism. They are not OCD, and the usual medications are rarely effective, even though the diagnosis prompts traditional physicians to prescribe higher, more frequent doses, and/or a combination of pharmaceutical preparations. The recognition that processing difficulties underly these unusual behaviors has engendered the protocols that include ABA, PT, OT and other specialty therapies. They require significant resources, but have demonstrated improved outcomes. Certainly this approach is not as risky or potentially harmful as potent medications. Anxiety appears to be a result of a combination of the other processing difficulties, and social processing disorder is as real as any of the other contrived diagnoses. Early socialization is, therefore, a useful intervention. The fewer pharmacological interventions, the less chance that they will poison the growing brain. On another hand, certain abnormalities seem to be a result of difficulties in other-than-CNS processing. Aggression, opposition, and explosive behaviors are frequently gut-related. The recognition that autistic behaviors can be ameliorated by restoring the gastrointestinal microbiome has assisted many patients who have been suffering for years. The biomedical approach is unique in the treatment of this myriad of medical conditions because the basic assumption is that they are due to a variety of upstream difficulties. The recognition that, in patients with autism, some neural pathways proceed down the right path, others stumble upon an incorrect route, some thoughts don’t propagate at all, while other symptoms are emanating from elsewhere, goes a long way to assisting patients in their improvement. This entry was posted on Sunday, September 18th, 2016 at 2:18 pm	and is filed under >ALL<, AD/HD, Alternative and Complementary Medicine for ASD, Asperger's Syndrome, Autism Therapies, Diets, Earliest Red Flags, Gastrointestinal Issue, Genetics, HBOT for ASD, Lyme, News-Maybe-Worthy, PANDAS etc., Patient experiences, Research, Reversing autism, Sensory issues, Sleep, Speech and Language, Vitamin B12, Vitamin D. You can follow any responses to this entry through the RSS 2.0 feed. You can leave a response, or trackback from your own site.